Man of the Match: Tom Wood was the official Man of the Match but Chris Robshaw put in his best shift for England. He was everywhere, cancelling out Richie McCaw and put in a performance that the famous England skippers of yesteryear would have been proud of. Key Moment: Brad Barritt's try upset the Kiwi applecart. They were just about to re-find their swagger after reducing the 15-0 half-time deficit to 15-14, but Barritt, who combined wonderfully with Manu Tuilagi, stopped the black tide to turn the match back in England's favour. Hero of the Game: Owen Farrell went into the match with the unasked for accolade as one of the world's best four players, due to him being included on the IRB shortlist for Player of the Year, hanging over him. But if there was any pressure on his shoulders, then he did not show it. He kept the scoreboard ticking over and pushed the All Blacks defence back at every opportunity - a massive performance. Villain of the Game: Dan Carter missed two straight forward kicks at the posts and was lacking his usual array of attacking weapons. Farrell was brilliant in opposition, but Carter's alarmingly poor performance, by his sublime standards, will have caused the Kiwis some concern. Talking Point: Where did this England performance come from? It was superb and it is one that the Twickenham faithful will be talking about for years to come. Play of the Game: Brad Barritt's try was superb. He made a break through the Kiwi lines, winged it to Manu Tuilagi who then returned the favour and Barritt crashed over. It was off the training paddock and it was a brilliant score. England produced an astonishing performance to beat the All Blacks 38-21 at Twickenham on Saturday in their biggest victory over the Kiwis in their Test history. Owen Farrell kicked England into a 15-0 lead before the All Blacks hit back with two tries in three second-half minutes from Julian Savea and Kieran Read. Twickenham sensed the worst. The All Blacks had found their cutting edge and a third consecutive defeat to southern hemisphere opposition seemed in the offing. But England responded with a stunning three-try blitz from Brad Barritt, Chris Ashton and Manu Tuilagi and the records tumbled. The All Blacks had not lost in 20 matches. They had not lost an autumn Test for a decade, since England beat them 31-18 in November 2002. That England team went on to win the Rugby World Cup a year later. Stuart Lancaster's current England team are at the opposite end of their development. The absence of Toby Flood through injury left them without a single 50-cap player. England had fewer caps in their entire starting line-up than New Zealand had in their front row. The team's character had never been denied but their maturity and ability to turn positive performances into results had been questioned after narrow defeats to Australia and South Africa. No longer. England rocked the All Blacks. New Zealand were hit by a vomiting bug in the week. But not as hard as they were hit by England. The first signs of England's physical dominance came in the lineout and with their early ball-carrying, with Joe Launchbury, Tom Youngs and Tuilagi all making early ground. But it was without the ball that England really set the tone. Their kick-chase had the All Blacks under pressure and they swamped New Zealand in defence. England had a slice of fortune when Cory Jane was judged to have strayed marginally offside before collecting Dan Carter's inch-perfect cross-kick. Carter, almost inexplicably, also missed two penalty shots at goal. England felt they had not had that bounce of the ball against Australia and South Africa. Today they made the most of it. After 21 minutes, England won a scrum penalty and Farrell kicked a fantastic touch, to move play into the All Blacks 22 for the first time and Geoff Parling won a confident lineout. England drove powerfully but fell foul of the new five-second law after referee George Clancy, under the mistaken impression the maul had halted, called on scrum-half Ben Youngs to use it. New Zealand were awarded the scrum but England kept the pressure on. Tom Wood charged down Savea's clearance to keep England in the All Blacks 22 and more pressure earned another lineout. Ben Morgan peeled off the driving maul, Chris Robshaw crashed the ball up the middle and England moved it wide through Morgan and Alex Goode to Ashton. The wing dropped the ball but he was well covered anyway and referee Clancy brought play back for a penalty, which Farrell kicked confidently to push England ahead. Almost immediately from the restart, Morgan was penalised for hitting a ruck from the side but Carter missed his second shot at goal from virtually in front of the posts. New Zealand began to work through the phases but England's white defensive wall responded with some ferocious tackles, notably Tom Youngs on Carter, before Dan Cole won a turnover. Israel Dagg tried to run back a Ben Youngs box kick but he was smothered in his own half by Launchbury and Wood, who won the penalty and Farrell coolly kicked the goal. Keven Mealamu then overthrew a lineout and England were back on the attack, with Tuilagi and Goode combining to break the gain-line before Farrell slotted a drop-goal. As the clock ticked down to half-time, England kept the ball. Robshaw drove around the fringes, the All Blacks were drawn offside and Farrell slotted his third penalty. England then extended their lead beyond two converted tries when the All Blacks scrum went down and Farrell landed his fourth penalty from wide on the right. But when Farrell scragged Aaron Smith at a ruck near England's line and was penalised, the tide appeared to have turned. New Zealand went for touch, won the lineout and then spread play to the opposite wing where Savea cut infield and beat four defenders to score, with Carter converting. Suddenly, the All Blacks had their tails up. Farrell was under pressure as he tried to clear England's lines and he failed to find touch. Dagg danced down the right touchline, England's defence was disorganised and the All Blacks cut them open again with Jane and Conrad Smith combining to send Read over. England could have wobbled under the onslaught of two tries in three minutes. Instead, they hit back with a vengeance with Tuilagi the destroyer in-chief. Smith drifted too early in defence, Barritt straightened through the gap and passed to Tuilagi before receiving the offload back to score his first Test try. Farrell's conversion hit the crossbar. Tuilagi then crashed through two defenders as England attacked from clean lineout ball and his perfectly-delayed pass sent Ashton searing over the line for his first try in 12 Tests. 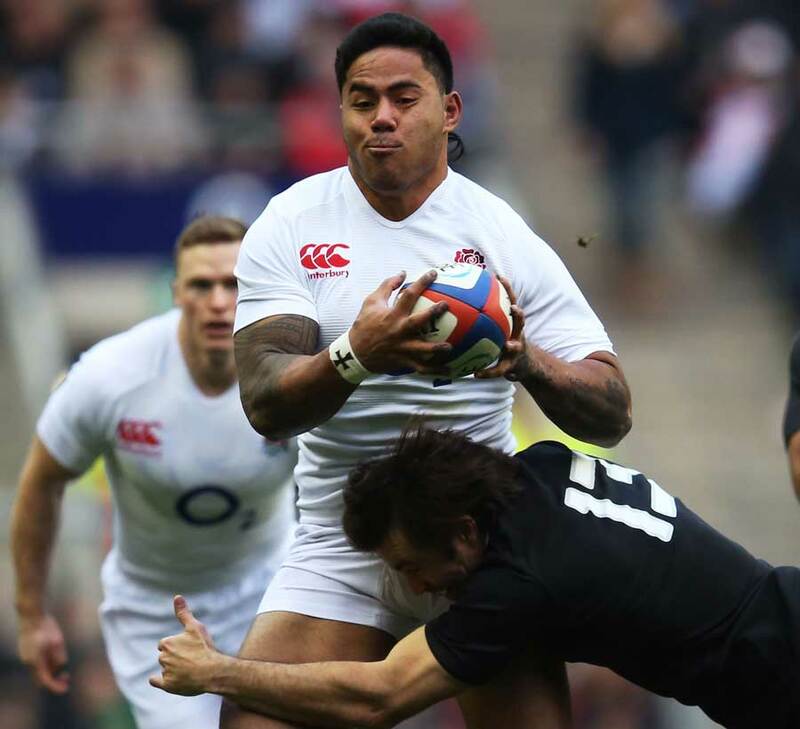 Tuilagi then picked off a loose pass from Read and galloped 50 metres for England's third try in eight minutes, which Farrell converted before being replaced by Freddie Burns. The Gloucester fly-half wrapped up the victory with two penalties. Savea scored his second try with five minutes remaining but nothing could deny England their first win against New Zealand in nine years.